Origin and Habitat: Cape of Good Hope (from the Cape Peninsula to Swellendam), in South Africa. Altitude range. From sea level up to 1000 metres. Habitat and ecology: The plants grow is a winter rainfall area, mainly in mountainous terrain in acidic sandy soil. They often grow between rocks and even in depressions on sheets of sandstone rock. It flowers well after fire. This subspecies is quite common and because of the fairly inaccessible terrain its survival is assured. Description: Agapanthus africanus (African lily) is an ever-green clump-forming perennial plant with rhizomatous roots, bearing tufts of long, arching strap-like leaves, and clusters of light to deep blue (or white) funnel-shaped flowers (umbellate inflorescenses) on stalks held above the leaves. A great many hybrids and cultivars have been produced and they are cultivated throughout warm areas of the world. Dwarf form available. Leaves: 6–8, lorate, narrow, arching, green, fleshy, 10–35(-60) cm long, 1-4 cm broad. Inflorescence: Peduncle leafless, stout, erect , 20-90(-120) cm long. Flowers 20-30(–50) in an umbel, funnel-shaped, open faced, bright blue, rarely white. Each flower 2.5–5 cm diameter. Spathe-valves 2, broad, membranous, falling early; pedicels 3-7.5 cm long, articulated at the apex. Perianth 4-5 cm long. Segments 8-12 mm broad, at least twice as long as the tube, distinctly keeled. Blooming season: The plants flower mainly in summer ( in habitat from December to February). Fruits (capsules): 4 cm long. Seeds: Up to 12 mm long. 9) Bailey, L. H.. “Manual of Gardening” (Second Edition). Project Gutenberg Literary Archive Foundation, 2005. 10) Bailey, L.H. & E.Z. Bailey. 1976. “Hortus Third” i–xiv, 1–1290. MacMillan, New York. Cultivation and Propagation: Agapanthus are one of South Africa's best known garden plants and are grown in most countries in the world. Their strap-like leaves and striking blue or white flowers make them favourites in plant borders as well as in containers. Flowers are useful in cut flower arrangements, and they make excellent pot plants. It was introduced to Europe at the close of the 17th century and is hardy if protected from severe frosts. In areas that have cold winters they are generally grown in large pots or tubs that can be protected from frost. Agapanthus africanus is more difficult to grow in gardens than A. praecox, and almost all plants sold as A. africanus are Agapanthus praecox. Soil: For best performance, give agapanthus rich, well-drained, slightly acid, soil with plenty of decayed organic matter and appear happiest if pot bound. Fertilization: They will flower regularly if fed with a slow release fertiliser in spring. Water requirements: Water deeply and thoroughly during the summer months. Propagation: They may be propagated from offsets or by dividing the rootstock in early spring or autumn. Hardiness: Zones: 8-11. Although a light frost is tolerated, protection may be needed if the temperature drops below -7° C.
Maintenance: Lift and divide clumps every four or five years to ensure flowering. Remove old flowering stalks for a neat appearance. Uses: It is an excellent groundcover plant for stabilizing soil on slopes and preventing erosion. Often it is selected for planting in difficult seaside gardens because of its salt tolerance and ability to stand up to the wind. 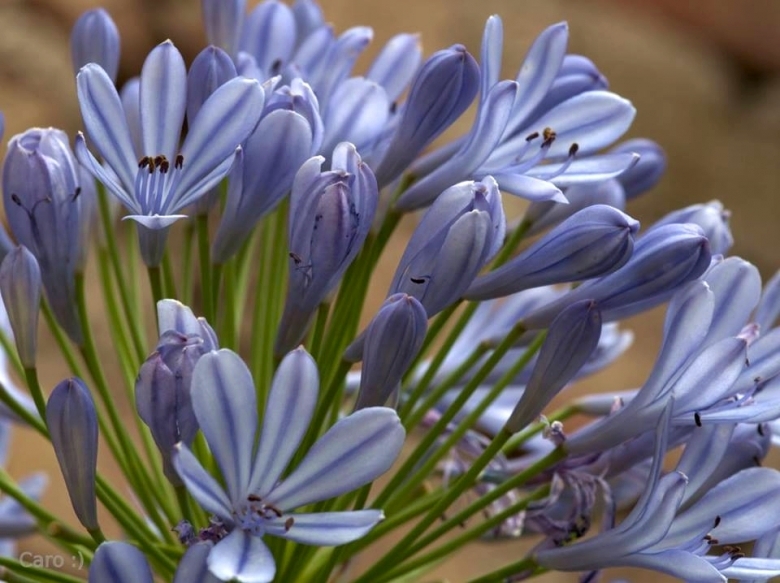 Traditional uses: The genus Agapanthus has been used in traditional South African medicine. The plant is used to treat pregnancy related problems and to augment labour. In Zulu herbal medicine Agapanthus root infusions are used to treat chronic coughs and serious heart disease. Propagation: Division of established clumps is the best way to be sure that plants will be true to type. However, seeds can be sown fresh in late summer (or store them in the refrigerator until spring). The seed germinates best if sown in a well-drained seed mix and lightly covered. The seed trays should be placed on heated beds under a mist spray set for about five minutes twice a day. Germination takes place in 4 to 6 weeks and the trays should then be removed to a lightly shaded area. Do not plant out until their second yea, but pot up as necessary for good growth.